For any busy household, as ours is, products that make life easier, safer, more convenient and more fun are always a big hit. Before our VTech cordless phone review, I’d never assumed that we could get so much from a simple cordless phone. My parents own and operate a kennel and during the summer and holidays, it can get incredibly hectic there. My dad is a genius at rigging technology to their advantage; they even have a doorbell that detects when a car pulls into the driveway to let them know when a customer or guest has arrived. Thanks to VTech, there’s nothing that my dad has invent or rig to help with this security issue. We actually found a creative way to utilize the VTech Video Doorbell Cordless Phone System. For any homeowner, the VTech 2 Handset Answering System with Audio/Video Doorbell is the ultimate tool in home security. Unlike the average cordless phone on the market, this one combines a cordless telephone with a digital camera doorbell and video monitor. It’s simple to install and connect and, especially if you have children or elderly at home, will create a much more secure feeling whether you’re home or not. 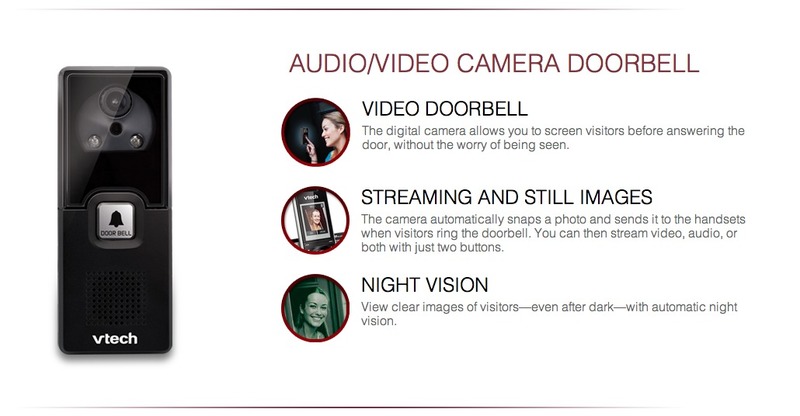 When someone approaches your door and rings your doorbell, the camera snaps a photo and sends it to the cordless headsets along with an audible bell sound. Using buttons on the phone, you can then stream audio, video or both. If you’re changing the baby and UPS rings your doorbell, you can instantly see and take a photo of their face and audibly tell them it’s ok to leave it on the porch. If your neighbor stops by with a bowl of soup and you’re in bed, sicker than you’ve ever been, there’s no need to get out of bed to see who’s at the door. The doorbell can be hardwired or can operate on batteries, which makes installation simple. The VTech 2 Handset Answering System with Audio/Video Doorbell operates as any cordless phone does, so it’s not complicated to use. The 1.8-inch, full color LCD screen is easy to read and view video or photos and creates a visitor photo log so you can see who stopped by when you weren’t home. When the phone rings, a Voice Announce Caller ID will let you know who’d calling, even when you’re in the other room. 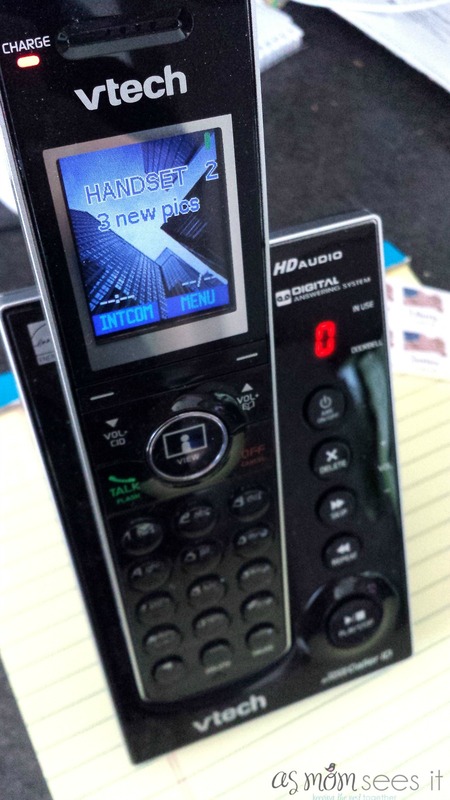 You can also use the speakerphone feature to talk between handsets, much like a walkie-talkie. The system is expandable, allowing you to add other handsets or an additional doorbell so, in the case of my parents, you can have one on your door and one your on-property business. To find out more about the VTech 2 Handset Answering System with Audio/Video Doorbell and other VTech products, you can visit their site, follow VTech on Twitter or on Facebook. The VTech 2 Handset Answering System with Audio/Video Doorbell retails for around $119 for the 2-handset system with audio/video doorbell. Originally published on 2013-07-17 by Dusty Bastian at As Mom Sees it .